A fine heavily cast window sash, window casement, or cupboard door latch. 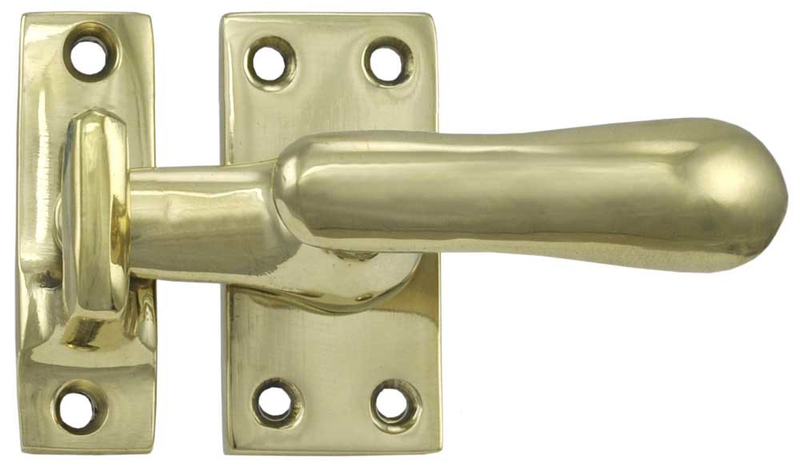 This latch can be used for both left and right hand applications, since the handle revolves 360 degrees to work either hand of the sash or door. Latch Base Footprint: 2" x 1"
Surface Catch: 2" x 5⁄8"
Handle of the latch extends 1 1⁄8" from the edge of the base. The tongue extends 1" from the edge of the base. Available in Polished Unlacquered Brass, Antique Brass Finish, or Nickel Plated for a silver tone. Also available in our matte black Oil Rubbed Bronze Finish. 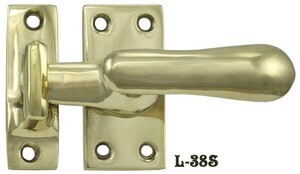 If you would like this latch with a mortised catch, please see L-38M. For the same latch with a rim catch, see L-38R.